Yesterday Heidi's participation in the 3-day Walk was celebrated with a send-off party at the salon. A potluck buffet of all pink foods was beautifully presented on a table well-appointed in pink! 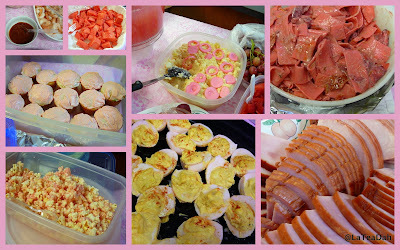 Their menu was eclectic: pink deviled eggs, pink potato salad, pink shrimp, pink cherry fluff, pink pork, pink popcorn, pink pasta, pink fruits, pink cupcakes, and pink lemonade. Even thought it was all one color, there was nothing boring about this 'think pink' spread! Clients, employees from neighboring business, and stylists together enjoyed a lovely lunch.